“Climate Selfie” is all about taking action our “selves” against climate change. Artash and Arushi demonstrated a world where tall buildings / condominiums in the cities (such as Toronto, London, New Delhi and New York) can act as Clean Energy and Local Food producers using solar, wind, thermocouple (peltier chips), microbial fuel cell and other renewable sources, instead of being energy guzzlers which cause climate change. 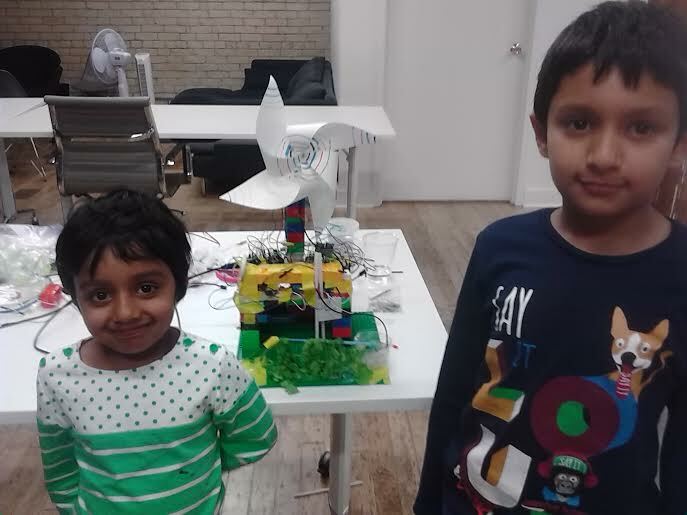 Using Lego blocks Artash and Arushi created a condominium building and then placed a windmill on the top of it. 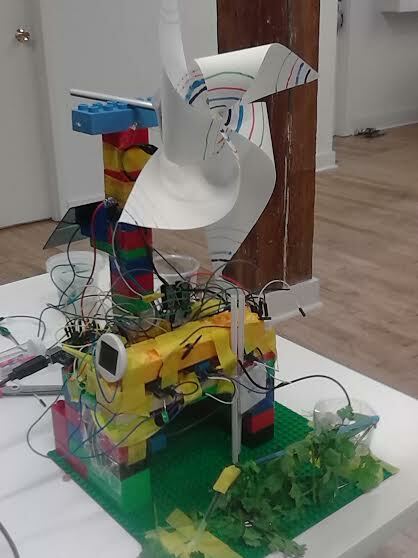 The Windmill had magnets and coil attached to it which generated up to 0.5 volts.They placed 2 solar panels – one on the top of the building and other on the sides to generate another 4.5 volts of electricity. Using thermocouple (peltier chips) and biofuel produced from organic waste mixed with yoghurt, they were able to produce another 1 volt, bringing the total amount of clean electricity produced to be 6 volts. Design sketch of Windmills on top of condominium building. This energy was stored in capacitors and rechargeable batteries. Once clean energy was produced and stored, Artash programmed the light and fan sensors which switch on and off based on presence of humans and also the local temperature. This ensured that no electricity was wasted and appliances conserved energy on their own.. The remaining energy was used to water the plants being grown vertically (including basil and coriander).This was done by putting a drip irrigation system powered by a small motor. The motor switches on depending on the soil moisture level which is measured using arduino and sensors. The entire system from Energy Generation to Storage and Use within the condominium building is automated. It demonstrates that each of us have a role to play as Clean Energy and Local Food producers and not just consumers. More importantly, it demonstrates to young and old alike, that it is possible to produce clean energy they consume everyday – it is a matter of “self” choice and change in mindset. This is the vision of Climate Selfie. All the programming was done by Artash in Arduino with some assistance. Download the code from GitHub.